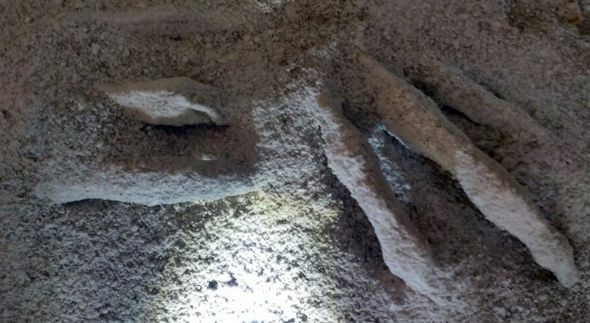 Gaia.com, the paranormal website behind outlandish claims that at least five mummified alienshave been found buried in Nazca, Peru, released a new video revealing the images inside the alleged tomb and the identity of the man said to have found them. 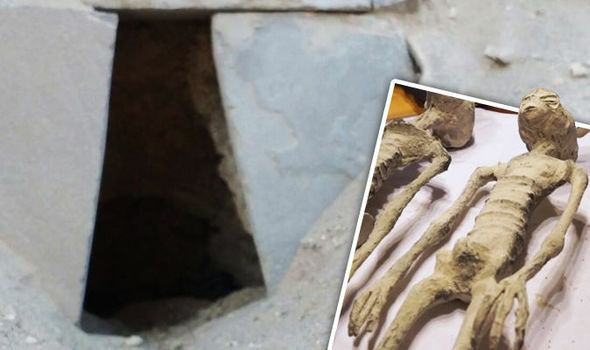 The film said a man called Mario was the explorer said to have stumbled across the remains in a tomb in an undisclosed part of the Peruvian region. 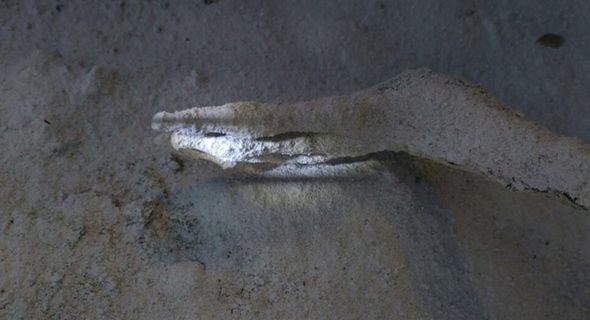 As a result, Express.co.uk asked Gaia.com and Mexican investigative journalist and ufologist Jamie Maussan, who is at the forefront of the claims, for details about where the so-called alien mummies were discovered. The entrance to the alleged tomb as seen in the video and (inset) some of the alleged aliens. These images were taken of the aliens as they were found in the tomb,the video claims. We asked for the location, who found them, whether it was part on an official dig, and if there were nay pictures of the discovery. Both Gaia.com and Mr Maussan failed to answer. However, the new video claims Mario, who was shown on camera but not given a surname, was the man behind the “world-changing find”. The video narrater said: “Mario helped with the discovery of many well known sites in Peru since the 1990s. Mr Maussan said in the film: “Inside this tomb, in a secret place, he found two sarcophaguses. “In one of them was just pure objects. In the second one he found two medium-sized bodies, and many little bodies. Mr Maussan said Mario would not agree to be interviewed on camera, or take the team to the site. The narrater said Mario believes he has touched just 10 per cent of the site, possibly less, and has no idea yet how far branches of underground tunnels go. The film said that the team investigating the discovery was given the “mummies” by French archaeologist Thierry Jamin. Another still from the video showing inside the alleged tomb. Mr Jamin is introduced as the President of the Inkari Institute, and it is alleged he obtained the mummies from Mario.The Inkari Institute based in Cusco, says it is a non profit and non governmental archaeological research organisation.Footage in the video shows what appears to be the entrance to the tomb and mummified remains buried in there. Mr Maussan said at an earlier press conference about the discovery that the mummified burial of the bodies suggests they once coexisted with our ancestors. He said: “These mummies were buried in human tombs, in sacred places. They claim tests show the bones to be 1,700 years old, and the beings had three fingers and elongated skulls. For years there have been claims by alien conspiracy theorists that aliens visited our ancestors and helped them build great structures like the Pyramids of Giza and Stonehenge. Mr Maussan has previously investigated a series of alleged alien body discoveries which turned out to be hoaxes.many ufologists believe the Gaia.com films are just promoting a massive hoax.Nigel Watson, author of the UFO Investigations Manual said they were “plaster of Paris fakes”. UK-based UFO investigators Steve Mera and Barry Fitzgerald have set out to get to to the truth. In a press release, the pair said: “Recently, the internet exploded with images of newly discovered mummies, discovered in the region of Nazca, Peru. Mr Mera told Express.co.uk: “We are officially representing the Inkari Institute (run by Mr Jamin) as part of delivering the full information to the public.